The new iSight camera on the iPad is a big deal because it finally crosses over the 1 MP mark. It's a 5 MP unit capable of 2592 x 1944 resolution photos, offers touch focus, face detection and geo-tagging. It also supposedly uses a 5 element lens, much like the iPhone 4S does. There's no HDR setting on it which was kind of odd. Other than that, the camera app UI is all too familiar - you get a bottom bar with options, switch to front facing camera and camera/camcorder toggle. On the left there's a preview box where you'll see the last taken photo. You can also view photos via a swipe to the right ala Windows Phone. The camera was fast to take photos and took very little time in shot to shot scenarios. The resulting photo quality is pretty good. It produces good images with nice colors, plenty of detail, even beating the iPhone 4 at times. Overall, despite the somewhat high luminance noise levels and the blowout of some specific color channels under bright sun such as red or yellow, the new iPad has a spectacular camera. We did test the new iPad versus the iPhone 4. It looks like the new optics is really worth its salt. While there might not be that much difference in the macro shot directly below, the crop from landscape shots further down show the new iPad's camera is even better than that of the iPhone 4. The new lens is supposed to ensure better low light performance but even outside in the bright sun it produces excellent photos. And judging from the various samples we took, it seems the iPad's iSight camera offers a slightly better dynamic range than the iPhone 4 too. Quite expectedly, the new iPad is capable of 1080p video recording at 30 fps. The camcorder interface offers nothing but a virtual capture key and front/rear camera switch. You can't lower the resolution, use effects or even enable viewfinder grid. Nada. Fortunately, touch focus is enabled and works during capturing as well. The AE/AF (auto exposure/auto focus) lock works fine too - you just tap and hold for 2 seconds while recording. The video quality is quite similar with the iPhone 4S - plenty of resolved detail lively and accurate colors, good contrast and steady frame rate. The video stabilization works well too. Here is a YouTube video we've uploaded, just don't forget to switch to 1080p mode and turn on fullscreen mode. And here is an untouched 1080p@30fps video taken with the new iPad. 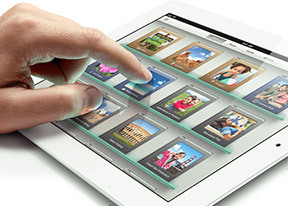 The new iPad is in our Video Compare Tool database. Check it out - the tool's page includes a quick walkthrough on how to use it and what to look for. The comparison tool proves the new iPad videos are the same as the iPhone 4S samples and will easily make other tablets and smartphones jealous.